Karnika Seth is a renowned Cyber Lawyer and Expert, and is the Managing Partner of Seth Associates, a law firm in India. She practices law at the Supreme Court of India and the Delhi High Court, and is advisor to many corporate houses and IT companies. Ms. Seth has been officially consulted by the Lok Sabha and the Ministry of Information Technology for her recommendations to develop cyber law in India. She is also a legal advisor to Office of Comptroller of Certifying Authorities under the IT Act, 2000. Ms. Seth has also actively resolved many cybercrime cases with the Indian law enforcement agencies. She is an active speaker on cyber law issues, both in print and electronic media, and delivers special lectures to judicial academies, police academies, Central Bureau of Investigation, senior government officers, industry associations, and corporate entities. She holds a Master’s Degree in Corporate and Commercial Laws from the King’s College, University of London. For authoring this book, Ms. Seth was awarded the Certificate of Honour by the Chief Justice of India on the occasion of Law Day in 2012. THE INFORMATION-communication revolution that is transforming the world around us has done wonders in the way we think, the way we conduct ourselves and the way we organize relationships across, space , time and cultures. While governments are finding It difficult to govern in the cyberspace , businessmen and entrepreneurs are discovering new ways to expand their activities with the help of the new technology. Jobs are going to places miles away from the place where the company is located and a virtual world is born outside the control of nation states and corporations. Along with it , the laws and systems of the real world have increasingly became ineffective in its regulatory functions ,challenging established ways of altering relationships within nation states. The digital world is thus creating its own jurisprudence in which individuals and corporations are becoming law makers as much as governments and international institutions. It is this bewildering legal and technical scenario which is the subject of analysis in the book. According to the author the book is the product of over twelve years of study and reflection during which she refined her understandings of cyber law in theory and practice. Her object in writing the book was to cater to the needs of ” technical persons who have no legal background and legal persons with no technical background” to be able to communicate with each other and help develop the new technology to the advantage of people everywhere. The author also seeks to explore the rights and the obligations of the internet users so that they do not risk their safety and privacy in the cyber world. To those in government and judiciary involved in enforcing the cyber laws and regulations , she hopes to impart knowledge of its implications for effective enforcement . Thus, the attempt of the author is to serve the needs of all concerned with the computer and internet enabling them to work together under a regime mutually beneficial and yet different from that they were used to till the advent of the new technology . After reading through the text and the appendices the reviewer is of the view that the author has succeeded in her mission to a large extent. One must however say that in attempting to be comprehensive the book has become excessively voluminous and costly particularly for a student or a beginner in legal practice . Unlike other publications on the subjects one finds in the market , the book contain a useful glossary of technical terms now familiar to technology experts and a glossary of legal terms which law persons are familiar with. This is indeed helpful to the multiple users with different backgrounds who might use the books to know the law and the technology behind it. The book is organized in 14 chapters and 10 appendices, beginning with a historical narrative of the evolution of cyber space , it examines the dilemma of establishing jurisdiction with the help of international instruments, domestic laws and best practices now in vogue. By way of conclusion the author says, “till the time the utopian homogeneity in law is attained and a universal forum to settle cyberspace disputes is established, one may have to rely on principles of personal jurisdiction elucidated by courts of different jurisdictions that also settle offline disputes”. The next four chapters deal with substantive issues relating to e-contracting electronic commerce , electronic signatures and electronic money. The Indian Information Technology Act and the rules made thereunder have made these practices legitimate in the business world though there are gaps and uncertainties in the law and its interpretation in different fact situations. With technology constantly changing, the problem and challenges are unending and the law finds itself way behind technological developments. Since the problems are common to all jurisdiction across the globe, it becomes inevitable to see how other countries are addressing the issues and what the U.N. and other international bodies outside U.N. are trying to do to harmonize the law and its practice. Chapters 7 to 11 deal with matters relating to governance of internet and cyber space. How does e-commerce and business profits get taxed since they involve intangible goods and on-line transaction? There are different principles and interpretations employed by different jurisdiction and there is the U.N. model of Taxation of e-commerce. There are different tests to determine on-line taxation all of which have their own weakness in implementation. The book discusses these problems without suggesting any solution to all such situation. On the question of protecting intellectual property rights on copyrighted material in digital forms, the author analyzes judicial opinions in a number of land mark cases with a view to draw up the principles to follow. According to the author , it is for the intellectual property rights holder to protect their IP assets, whether patent or trademarks or copyrights by using available technological tools, developing a regulatory regime which is appropriate to the technology and seeking strict enforcement by authorities. “Thus, a multi pronged approach encompassing technical, social and legal measures will be required to adequately protect intellectual property rights in cyber space ” writes the author. Protection of data and of privacy is indeed a serious threat on the internet . Laws are yet to be adopted in many jurisdiction in this regard. International organizations and Internet users are working on strategies which can effectively protect the legitimate interests while allowing free access to cyber space for all with minimum restrictions. It may be relatively easy to legislate but difficult to enforce. Fundamental right for free speech and expression is involved and censorship is not practical nor desirable. What is recommended for the present is “net neutrality in relation to internet transmission irrespective of content and origin of communications flowing over internet”. However, committing crimes using the new technology cannot be tolerated and they need to be dealt with as such under the law of the land. Chapter 10 of the book discusses the growing number and variety of cyber crimes known by different words and phrases and how they are dealt with under the information technology Act, 2000 and the Amendment Act of 2008. Under the title “Author’s Recommendation” a dozen steps are proposed in the book to strengthen the enforcement regime against cyber crimes which includes enacting new laws, adopting guidelines, training enforcement personnel and signing international cyber crime conventions. A key factor in this regard which is increasingly acquiring importance in the police and security agencies is the collection and analysis of electronic evidence which is the subject of chapter 11 of the book. The Information Technology Act and the rules and regulations are analyzed in this regard and some conclusions drawn to suggest the way forward. The last two chapters are devoted to highlight some emerging issues in the digital world which are still outside the legal regime and where principles are being debated for possible adoption of some sort of convergence laws. With technologies converging it is inevitable that a convergence law has to come as a suitable response to the emerging situation. Laws in this regard are being adopted in some developed countries and one is proposed in India as well. The final chapter of the book is on” Online Dispute Resolution” whose time has come with increasing e-disputes, digital evidence and pressure for quick and cheap mechanisms for disputes settlement. There is scope for using negotiation and mediation in on-line dispute resolution processes. The existing laws and judicial processes are conducive to promote on-line resolution. What is awaited is the readiness of the legal and judicial professions and their ability to operate digital procedures with ease and professionalism. This is the task which law colleges will have to take on board so that future generation of lawyers and judges are comfortable with the new technology and competent to operate the legal system based on it. It was not easy for the reviewer to prepare this review because of lack of competence in the new technologies and its applications. However, reading the book once and examining certain parts of it once more gave instructive insights into both technology and the emerging jurisprudence around it . The reviewer is sure, for those similarly placed, this book will be an excellent tool to acquire the basic knowledge necessary to understand the laws relating to internet and information technology to be able to operate in a digital regime that is surrounding us day by day. 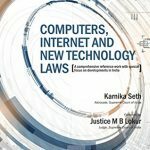 No law person can afford to be ignorant of the virtual world of internet anymore and this book is an invitation to introduce them to the laws and principles involved.